Event organizers (left to right): Adam Helmers, Katie Chien, Yasmin Koop-Monteiro, Kelsey Bush, Mackenzie Coombe and Jennifer Hao. Absent: Jenna Hassan. According to Environment Canada, approximately 900,000 tons of waste is created each year between Thanksgiving and Christmas. 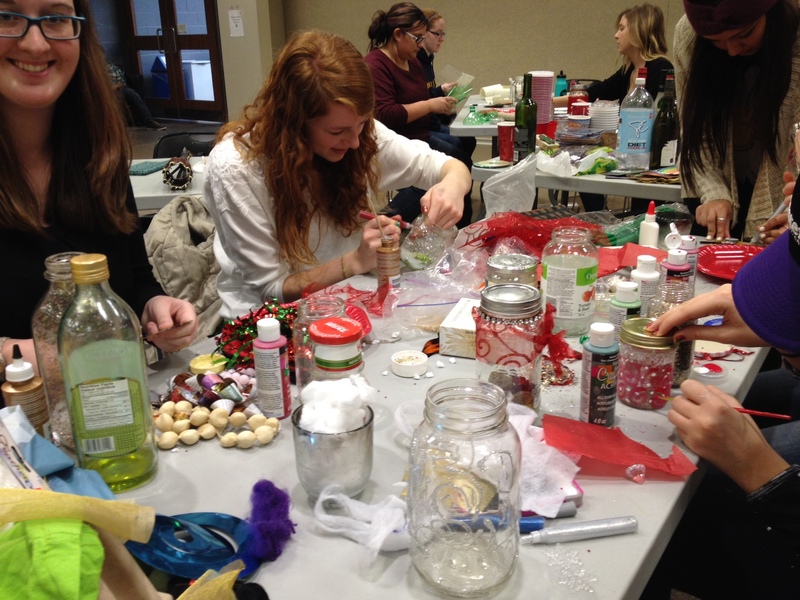 Two University Students Council groups, EnviroWestern's London Youth Sustainability Network and the Peer Support Network, combated this problem by hosting "Buy Nothing, Make Something This Holiday" last week in the Mustang Lounge. On Thursday, December 15th, over 60 students dropped in on the event during their lunch break and created up-cycled gifts from formerly used items such as mason jars, toilet paper rolls, bottle caps, and wine bottles. They decorated these items with supplies destined for the trash, such as magazines, old paint, ribbons, glitter, and more. The event was also initiated to help students take a stress-free study break during the busy exam season to promote mental and social health. The goal was for students to make their own gift to give, instead of going out and spending money and hours shopping, and eventually creating more waste. Only a small amount of paint and glue-sticks were bought for the event, which will be reused for future events. As unconventional as it may seem, several perfectly in-tact decorations were even fished out from three garbage cans, washed and reused from a previous Western Holiday event. Visit http://www.allfreechristmascrafts.com/Recycled-Christmas-Crafts/21-Christmas-Crafts-from-Recycled-Items for Christmas craft ideas from recycled items. If you're interested in not only joining, but leading a variety of other sustainability initiatives hosted by EnviroWestern’s London Youth Sustainability Network, email lysn.envirowestern@gmail.com. Also, if you're interested in helping to promote mental and social health awareness, email peersupport@westernusc.ca. Have a wonderful holiday season, and support Western’s mission to become a Zero Waste campus by Buying Nothing and Making Something this Holiday!